The EasyIO FC series is aimed at affordable ‘canned’ solutions for standalone applications, such as Roof Top Units, Fan Coils, AHU’s, package units etc. The FC20 is the first product in the FC range, designed to complement the 30P and FG series of awarding wining excellence. All of the FC series products are equipped with two RS485 ports and no Ethernet port, for Ethernet applications you can upscale to the 30P or FG series. All FC products are BACnet and Modbus Selectable and can be programmed via the CPT Tool or Niagara AX framework. The FC 20 has 20 points of I/O and priced to meet most high volume applications and price points. The new FC-20 is a microprocessor based controller consisting of 20 inputs/outputs (I/O) to accommodate general and specific applications featuring BACnet MSTP and Modbus RTU communication protocols. 20 IOs include, 12 Universal Inputs (UI) supporting current, voltage and resistance based sensor, 4 electrically isolated Digital Outputs (DO) and 4 Analogue Inputs supporting current and voltage outputs. The FC-20 comes with one standard RS485 driver to support either BACnet MSTP or Modbus RTU communication (selection via hardware dip-switch). This communication port is also used as configuration/ setting and firmware upgrade. The concept behind the FC series is that the FC-20 is configured can be used as an input/output controller only, or an Application Specific Application Controller. 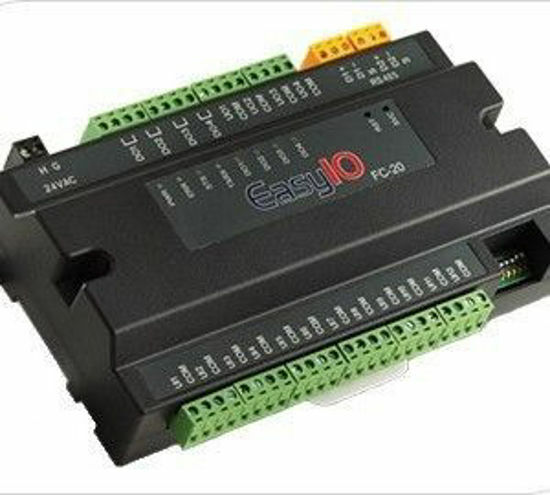 There is also a Real-time clock and a second RS485 (reserved for communicating with other Modbus devices such as Power Meters) are provided for such application.